Eight years had gone by, almost unnoticed. He was a captain aboard one of the many towboats that regularly traveled along the Meta River from Puerto López to Puerto Carreño and back, crossing the eastern plains of Colombia, where this river meets the Great Orinoco. The same agile character I traveled with when he was captain aboard the towboat Perla. Perhaps his eyes a bit less expressive and somewhat sadder. -How did you finish your trip, when you landed with your motorcycle in the Casanare River? His memory was intact. Fine, Benicio, but the best stretch was aboard the Perla, that´s for sure. He just smiled and went for his second beer. A pure llanero, born in the eastern plains near Venezuela. Silent, brave, strong people. and I handed the photo. Sixty-eight years old, fifty on the river. If he could not guide me, nobody could. His answer would be definite for me. -It has no engine, it is called a kayak, not a canoe, it has one twin oar and a rudder. It is very light but you can load it with around 60 kilograms of cargo. It is four meters long. The distance to be rowed was 300 km, downstream. If I covered 50 kilometers per day, in six days I will do it. Silly calculations you always do before a trip. you have to do it -- before the river becomes very shallow and the breeze hits hard. -Benicio, what other nautical hints can you give me? Ive only rowed in large lakes, no currents, nothing like the Meta." just search the main waters." with the Llanos you can never tell. Last beer in hand. 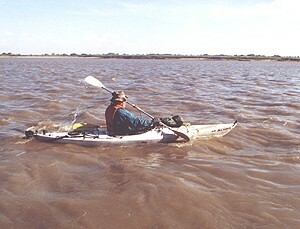 The kayak, equipped with all the gear I needed, was on top the stern deck of the "Perla." I planned to sling my hammock aboard and, with the sun begin the journey. -Beginning the second day, youll meet them, said Benicio staring at his empty glass. Jjust say the truth. what did Benicio meant with this? Next morning, after an uneasy night I was ready to weigh anchor. Next to the compass, I attached the first two of the ten sections that showed the main geographical highlights along the route. They were my navigation charts. With the watchman we gently lowered the kayak, as a baby, upon the waters. With my lifevest on I slipped into the cockpit, lowered the rudder and left. I felt the pleasure -- and the fear -- of a departure. like the first kiss. A reddish mist rose above the surface. Flocks of red herons browsed over the current. Shortly after, I crossed a naval base. The signs on the riverbanks matched the names in my charts. But I couldnt afford to be overconfident. The paddling rhythm gradually increased and realized the nautical jewel I was depending on, whose original design came from the Eskimos. It was an extreme sensation of vulnerability. I remembered the story of a failed Spanish expedition to the South Pole, where all the logistics failed from the very beginning. "Sometimes, adventures sum up in being able to retreat," said the leader when he aborted the expedition. Will this be my case? "Happy New Year," I yelled to a fisherman, "Where is the mouth of the Humea River?" "Here they are" he answered. Studying my charts I had covered fifteen kilometers in an hour and a half. Ten kilometers per hour, not bad for a beginner. Time to stretch the muscles. On a beach I met another fisherman with a small overboard. We briefly studied the charts and he advised me to pass by Cabuyaro, the next port, and try to make it to the mouth of the Upía River. There I could spend my first night in a small fishing community. Around four in the afternoon, after eight hours of straight rowing I landed my craft in a sandy beach. Tired, I began to boil a well-deserved coffee when a fisherman arrived. Very friendly he introduced me to the other members of the community and offered me a shack where I could sling my hammock and spend the first night. Next morning, with a weather-beaten fisherman who had been a pilot of a towboat for many years, we studied the remaining charts. not even the towboats risk it." His advice was pure wisdom. Few fishermen, knew the entire length of the river as he did. Most of them were limited to their reduced daily universe, where they "earn their daily bread". They waved good bye and were surprised minutes after with a strong hiss at my port side. Like a shadow I was able to see the back of two large fish. They are the "toninas" or fresh water dolphins who were to be my friends on every river mouth from here on. Rhythmically paddling, steadily I advanced. A couple of hours went by; I had slept well last night and was more confident with the craft. Then I heard the unmistakable sound of a powerful outboard, and there it was, interrupting the rhythmical silence of my paddling. It was a red boat with a white hood; presumably it passed by, but a few seconds after it turned back directly towards me. By God, they were the fierce paramilitaries that controlled the entire region. Their security and intelligence devices had obviously failed because Camilo was very upset that nobody had seen me the previous day. Each word would be essential for me, I couldnt commit mistakes. A long hour passed by, and Camilo handed back my documents. He seemed less apprehensive. Silently I walked towards the riverbank. There was the kayak, intact. It was three in the afternoon. No time to waste, I needed to row at least two more hours to get out of eyesight of the village, and start looking for a beach to set up my first camp, alone. Thus I did; again the sound of an outboard in the middle of the night. Were they looking where I set my camp? By the third day of continuous rowing I realized the importance of starting my daily routine as soon as you can see, that meant waking up really early. 60 percent of your daily distance is done in the first three hours of continuous rowing. Time for a hot meal and some rest; the breeze is starting. I changed my course to a distant canoe. The surprised crewmembers were two natives from the Humapo reservation. When they learned my intention to reach Orocué, they looked at my craft silently with a mixture of skepticism and pity. We rowed side by side an hour or so, towards a place where they were going to sell their fish and have a deserved breakfast. They smiled silently and taught many tricks on how to maneuver in the mist of two feet waves. While we were having breakfast together, the towboat "Turpial" was heading upstream. Surely the last voyage of this season. We paddled together for some distance and they taught me, in spite of the upwind, rowing very close to the bank you could find small passages where the current was virtually unaffected by the fierce wind. I waved farewell to the wise and master navigators. Now and them, I checked constantly my position with anybody I found, either on the banks or sailing. Mentally, I had to continue robust. I could not permit my self to be overwhelmed by the immense, oceanlike vastness of the river in some of its stretches. My next geographical highlight was the mouth of the Manacaías River, roughly halfway to my destiny. Beginning the fourth day of continuous rowing I felt confident in what I was doing, in spite of normal muscular pains in my arms and back. But the best pain-reliever was the "toninas," when they began to dance around my noiseless craft. Beyond the Manacacías, while rowing close to the right bank, a black spot appeared in the horizon, not far, apparently moving towards me. With curiosity, I slowed a little. It was a battered canoe with a makeshift mast and a sail, that as Hemingway's Old man and the sea, "it looked like the flag of permanent defeat". Soon I saw a guahibo family with a little child, proudly sitting in the bow, sailing upwind. Mutual surprise and astonishment were our language. In silence we said many things. By now I was used to the "llanero" concept of distance. "You are near Cravo Sur," they assured me. That could mean one more day. After setting my camp, lighting a fire beneath an astonishing summer sky I went to sleep, thinking that tomorrow in the morning I could say to myself, "tomorrow I'll reach Orocué." In the charts I was using the navigation channel used to fix the distance, with no doubt, was done with an experienced pilot, like my friend Benicio. Many times I lost this channel or the "major waters," just to find a dead end. This meant to row back to find again the main current. With no doubt the distance I covered daily surpassed the one that figured on the charts. "Silly calculations" done beforehand. But really, according to my "silly calculations" the next night will be the last night, camping by myself because Orocúe was not further than 30 Km. Setting my last camp, the night was cooler. Like those nights Von Humbolt enjoyed on his trip down the Orinoco. From the small bay I chose, with the last light a shadow emerged. It was a fisherman checking his baits, for the nights catch. I invited him to share with me a cup of coffee I was preparing. He left his canoe tied to a trunk and walked towards my camp. He had the "woeful countenance" of a river wanderer. Ragged shirt, slightly limping and while silently sipping the hot coffee, for the first time I saw his eyes. or the blessing of living on this river. I gave him my small ax and the last provisions left. but for Manuel it was like many identical mornings past and to come, where his only hope and duty was a good catch in order to be able to feed his five children. The night swallowed him as he rowed back home. For the last two days, the rivers main channel was towards the right bank. Orocué is at the opposite, so I had to cross the river completely, and at this point, perhaps it is one of its wider sections. I lifted my last camp and started rowing the journeys last leg. The Meta awoke quiet as a lake but earlier than expected, the wind started to blow. I knew the port was rather near, but I decided not to ask anybody; I didnt want to deceive myself and just get there. I took a short break in a port, just opposite Orocué to have a brief breakfast. When I was slipping into my cockpit a fisherman came in and advised me to wait a while because the wind was getting stronger. I doubted a little and really the panorama was not encouraging. Small whirling sand tornadoes were being lifted on the beaches; the peaceful Meta had turned to mild whitewater river. stay here watching, please. If you see me run into trouble, send somebody to help me!" For the first time in a week I was frightened. Every stroke was in slow motion, trying to maneuver the kayak so that the bow will be right into the waves, by now at least three footers, just as the guahibos had taught me. I could never let a large wave to hit me by the sides! Every single hard-earned stroke was a small relief. With difficulty I reached the middle, near a large island. beyond the last curve a rusted, weather-beaten slanted sign with black, but beautiful letters O R O C U E ! Easy, old captain, just search the main the waters.